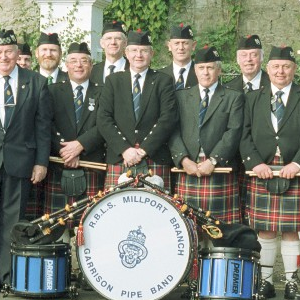 Since the bands formation in 1999, it has grown rapidly from modest beginnings of only ten pipers and a few drummers to close to 50 adult playing members. Band Members come from North Ayrshire and beyond. Our Pipe Major since 2002 is David Mitchell and Leading Drummer is John Hood. The adult band practices on a Thursday night from 7:15 pm in the K.A Centre, Kilwining. The K.A Center is located at the rear of Kilwining Academy. The Juvenile pipers practice under the leadership of Ian Mulholland also on a Thursday evening. All under 18's will be made welcome. If you want to know more, contact our secretary via our Contact Page. Keep up-to-date with all band information by following us on Facebook. 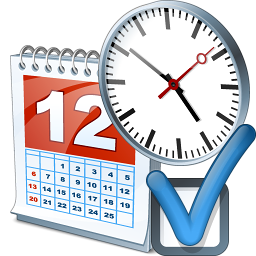 View the band schedule for the 2019/2020 season including all overseas trips. Meet P/M David Mitchell, Leading Drummer John Hood and the rest of the band. From the 5th - 17th August, the band embarked on it's fourth visit to Lorient. The bands performances as lead band in the main shows as well as in the various parades and solo concerts expressed the quality and variety we have to offer. 2 out of 3 complete. The Isle of Cumbrae have just returned from Avilés Interceltic Festival, Spain. A great five day was had by all, topped off by surprising guests at a Scottish bride's wedding in Pravia. 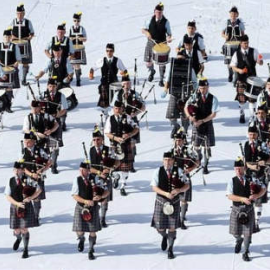 The band have just returned from Bressuire Highland Games in France. This was the bands fourth year attending the games and the friendships made with other bands alone made the games well worth the visit.